I am still so behind in blogging, but I’ve been busy, well, living life (but still cooking!) instead of blogging. I made this dish about two weeks ago, still in the theme of Thai (cuz what other theme is there that’s so great, really?). Before I get into this, I have to be incredibly cheesy and say I have the very best husband in the whole wide world. Pretty sure every married lady says that, but trust me, my husband beats all of yours. 😉 😉 We had such a fantastic weekend. On Friday night, he took me out to the Water’s Edge Lighthouse on the Mohawk River in Glenville/Scotia/Schenectady. We had an appetizer of fried calamari, and for dinner I had chicken parmesan (my favourite!) and Kevin had the special, some sort of steak with blue cheese, vegetables, and roasted potatoes. For dessert, we had raspberry sorbet, freshly made by the cook. It was definitely a treat! On Saturday, we spent the day doing car-related activities. What I thought would be an ordinary oil change turned into spending $500ish on a new water pump, cuz mine was in desperate need of repair. I have been going to the same mechanic since I moved to upstate New York 3 years ago, and I trust them, so I know when they say I NEED it, they mean business. Also, they showed it to us at the end, and it was pretty bad. Thankfully, we have an emergency fund for just such events (go Dave Ramsey!) Saturday night we went to Bible Study and it was so wonderful to be around a great group of people – eating yummy food, worshipping the Lord, studying Scripture, and just laughing and having a good time. Since this is getting really long, I’ll explain Sunday’s adventures in the next entry! This recipe was my first time experimenting with quinoa, and I was pleasantly surprised! It is sort of like cous cous, and can be used as a substitute for that, or rice. It is very healthy and packed with protein and, I believe, gluten-free. It is all the rage in my hometown of Seattle right now (Seattle is one of those cities that jumps on the fads of the moment bandwagon), hence why I’m only trying it now for the first time. There are a lot of instances where it is used as a side dish, but in this case, it was featured as part of the main dish. I’m still in-and-out of following Weight Watchers, but for those that are curious, one serving of this is 10 pts (based on my specific ingredients, that is). -Prepare quinoa according to directions (use chicken stock instead of water, for more flavour). -While quinoa is cooking, combine all of the sauce ingredients together in a bowl and whisk well to combine. -Once quinoa has absorbed all of the liquid (usually about 15mins), stir in the sauce and toss well to coat. -Add in chicken, carrots, edamame and green onions, stirring to combine. -Taste and season with a little salt and pepper if needed (I didn’t need to, but the original blogger added this in). 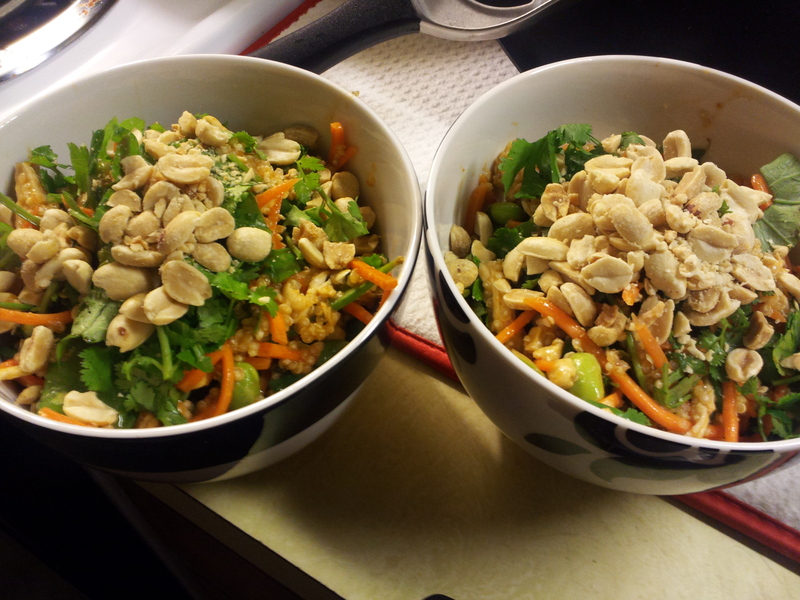 -Toss in half of the peanuts and cilantro, then serve in a large bowl, topped with remaining peanuts and cilantro.